Braces are placed to align teeth, close spaces and further correct the bite with the use of wires and elastic rubber bands. Metal braces are the most common type. They are made of high-grade stainless steel. Today’s metal braces are smaller, more comfortable and more attractive. We also offer a nickel free metal brace option. Clear braces are made of translucent (clear) materials. They are most popular with adult patients, due to their cosmetic appeal. 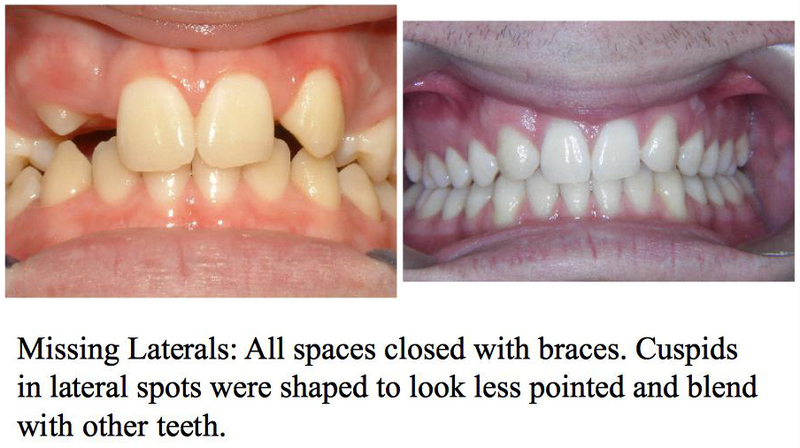 The only drawbacks to clear brackets are that they are most fragile, and the elastic ties can discolor between orthodontic visits. Stars are a series of clear retainers that are made on adjusted models of your teeth. Stars are used to make minor tooth movements that align teeth or close spaces. A large percentage of our patients are adults, and they agree that it’s never too late to improve their greatest asset- Their smile. Tooth alignment can be changed at any age if your gums and bone structure are healthy. Orthodontic treatment at later stages in life can dramatically improve your personal appearance and self-esteem. Improving the health of your teeth and gums is equally important. Crooked teeth and a bad bite can contribute to gum and bone loss, tooth decay, abnormal wear of the tooth enamel and surfaces, headaches and jaw joint pain (TMJ/TMD).